Are you overwhelmed, frustrated or anxious when you are at home? Are you thinking about what household routines are best for your family? Are you concerned about the clutter in your living spaces? Are you happy and content with your lifestyle? Do you need tools to get you from unorganized to unstoppable? Are you interested in environmentally friendly recycling and donating to charities? 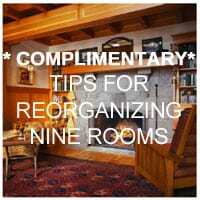 Trying to organize your home and office can be overwhelming, but you don’t have to go it alone! Julie Stobbe understands what you’re going through, and she’s ready, willing and able to create a solution that’s just right for you. enjoy real peace of mind! Organizing your living and working areas is just a case of Mind over Clutter!